SF 15 Session 2a - Richie Poulton : Men and mental health - What has the longitudinal research taught us? 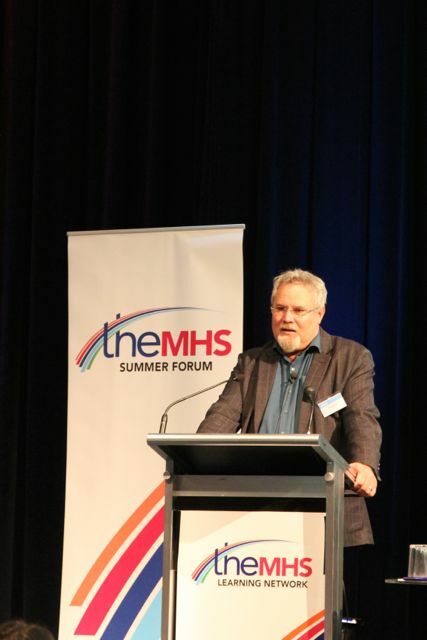 - TheMHS Learning Network Inc.
SF 15 Session 2a – Richie Poulton : Men and mental health – What has the longitudinal research taught us? Richie began by summarising the Dunedin Longitudinal Study of 1,037 babies born in one year (1972-73) in Dunedin, New Zealand. He highlighted two particularly striking features of the participant sample. First, everyone eligible to participate was approached, and 91% of those approached took part in the study, making the sample highly representative. Second, rates of retention have been remarkably high, with almost all of the cohort still participating (2.5% of the original cohort died, and of those still alive, 95% are still participating). Of this original sample born in Dunedin, 25% now live overseas. Richie explained that for follow-up assessments, participants are brought back from wherever they are in the world to the lab in Dunedin, which allows researchers to take a rich and diverse range of assessments from participants. A broad range of factors are assessed, including socioeconomic factors, antisocial behaviour, personality, childhood adversity, cognition and neuropsychology, mental health, intimate relationships and domestic violence, and physical health (including oral, respiratory, sexual, and cardiovascular health). After giving an overview of the Dunedin study, Richie discussed data on gender and mental health. He referred to literature demonstrating that women tend to have more internalising problems (e.g., anxiety, depression), whereas men tend to have more externalising problems (e.g., substance abuse, antisocial personality disorder). Men are also more likely to experience psychosis and thought disorders. However, Richie challenged the notion that depression is mainly a female issue. Highlighting data from the Dunedin study, he demonstrated that whilst more women than men may experience depression, 40% of depression is found in males: it is not a “female” disorder. Richie then focused on findings from the Dunedin study relating to antisocial personality disorder, a disorder seen far more frequently in males than females. In doing this, he highlighted two different groups who engage in antisocial behaviour and criminality. The first group, which is smaller (10% of all males; 5% of the total population), engage in antisocial behaviour throughout their lives and also experience neurodevelopment deficits and social/familial disadvantage. The second group, which is larger (around a fifth of the total population) do not have these developmental/social disadvantages, but they begin to engage in antisocial behaviour in adolescence and this behaviour is largely driven by peers and social mimicry. Richie highlighted the need to tailor therapeutic interventions to these different backgrounds. With the first group, he emphasised the need to intervene with both the child and their family as early as possible – individual approaches are unlikely to be successful given the familial challenges they carry with them from early life. By contrast, with the second group, he highlighted the importance of avoiding group intervention approaches, given that the antisocial behaviour is partly driven by peer influence, therefore individual interventions are needed. Richie noted the potentially damaging effects of prison in this group, stating that “prison is a group intervention which tends to expand rather than diminish the antisocial repertoire”. Richie concluded his talk by discussing some exciting recent research exploring the impact of mental health problems on ageing in men. To contextualise, he highlighted that human longevity is continuing to increase, the quality of life experienced during these additional years is poor. A recent study examined potentially modifiable risk factors for ageing-related disability, including mental health problems. Using telomere length as a marker of biological (versus chronological) age, he explored the relationship between internalising disorders (depression, generalised anxiety disorder, and post-traumatic stress disorder) and ageing. There was a significant relationship between internalising disorders between 11 – 38 years old, and rapid ageing (assessed by telomere length) – but this relationship was only found in men and not women. This relationship remained statistically significant even after controlling for other strong predictors, including childhood maltreatment, cigarette smoking, substance dependence, psychiatric medication use, physical health problems, and socioeconomic status. In other words, internalising disorders still remained a significant predictor of ageing, even after taking into account the influence of other factors which are also strong predictors of ageing. At present, the mechanisms for this are not understood (e.g., do physiological processes involved in internalising disorders influence men more than women? Does oestrogen have a protective role? ), but nonetheless this research highlights the importance of preventing the development of internalising disorders in men given the deleterious outcomes on ageing processes. Richie concluded his talk by highlighting the need to challenge stigma around male mental health, and the importance of intervening early to prevent the development of mental health problems, not least to improve the wellbeing of men in the present moment, but also to give them access to a healthier future as we continue to live longer lives.